With the North Eden Fire 100% contained after it burned 13,763 acres, and no new fires to report in more than 100 miles in any direction, where is all the smoke coming from? Northern Utah and Southeast Idaho residents will need to look 700-800 miles to the west. According to the Utah Department of Environmental Quality, the storm front that brought rain to Cache Valley on Wednesday is also responsible for carrying the smoke from California’s largest wildfire on record (in addition to several large fires in Oregon) across Nevada and into Northern Utah. The National Oceanic and Atmospheric Administration has provided an animated map of where the smoke is coming from and what areas of the United States it is affecting. The haze in Cache Valley has created unhealthy conditions. 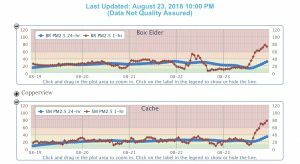 According to DEQ’s air quality index for Cache County and Box Elder County, PM 2.5 levels are squarely in the Red alert and Unhealthy category. People with lung disease, asthma, children and older adults or people who are active outdoors should reduce prolonged or heavy exertion outdoors. Everyone else should limit any prolonged outdoor exertion. The haze began to get into the Unhealthy for Sensitive Groups stage early Thursday afternoon. By late afternoon and early evening, PM 2.5 levels skyrocketed and kept climbing. Cache and Box Elder counties are home to the worst air quality in the state because of the smoke.